My mum gave me my one of my granny's cookbooks a few weeks ago. I do not know if it was a favourite but it was certainly well used. I had such a giggle this morning over some of the recipes especially making a salad with lemon jelly crystals! How much have our palates changed. But saying that I did find some unusual recipes which I am keen to have a go at. 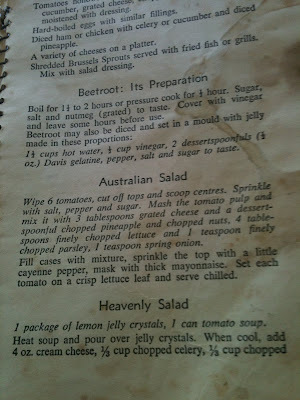 The jelly salads are alive and kicking in the USA - had those alot when I lived there! And yes, it seemed really weird to be eating it along with meat and vegetables. They usually serve it as a side dish (like we have bread). I really like the look of that Australian salad! Might try that. My mum used to give us the arrowroot mixture when we were sick as kids. It's quite yummy and I think its good for upset tummies. That book is a treasure, Sammy!